Carbon dioxide is one of the greenhouse gases that is causing dramatic changes in the Earth’s ecosystem. Different methods are being tried to curb CO2 emission to slow down global warming. But in our industrialized world, carbon emission is not yet sufficiently reduced and a lot more is to be achieved to slow down the adverse effect of the CO2. Build by CE, unique air capture plant brings new hope as it is designed to capture atmospheric (not geologic) carbon dioxide and this way can help in managing around 60 % of emission that are not emitted from particular sources. The CE’s technology works in the same manner as plants that is by taking in carbon dioxide and giving out oxygen. The company plans to set up its industrial scale massive plants, in areas where trees cannot survive such as deserts. The technology includes two processes: the first is an air contactor and followed by a regeneration cycle for ensuring ongoing atmospheric CO2 capture and generation of pure CO2. 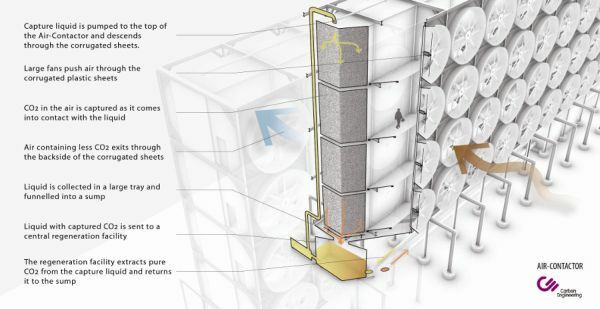 It is a device made of closely arranged, corrugated PVC sheets where atmospheric CO2 pulled in through fans, comes in contact with a chemical solution that absorbs CO2 naturally. This alkaline hydroxide solution has been modified by carefully chosen additives and concentration to optimal CO2 absorption. The cost effective air contactor design helps in trapping industrial scale quantities of carbon dioxide with low solution pumping and energy inputs for fans. The whole setup engages minimal land. In this process, CO2 laden chemical solution from the air contactor is treated to release compressed, pure CO2 and also to restore the original chemical solution to capture CO2 for future use. The pure CO2 can be further combined with hydrogen to create more fossil fuels. The input energy required to move fans is provided by natural gas. The CO2 released during the process of gas combustion is also seized along with atmospheric CO2, making sure no carbon dioxide is released to the atmosphere by the CE’s technology. 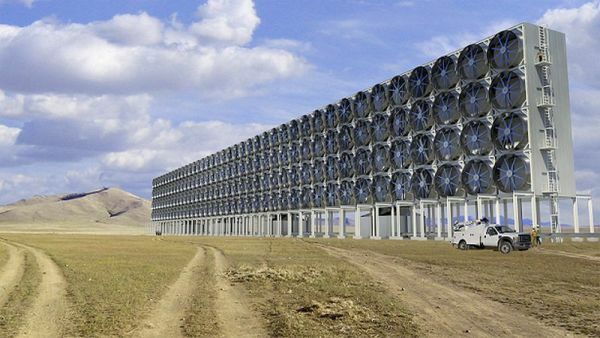 Going forward, designer plans to use carbon free sources of power for the air capture. They plan to collaborate with renewal and clean sources of energy as solar, thermal, wind or nuclear for its air capture plant. The first of its kind, full scaled commercial air capture unit is proposed to be set up in the year 2017. Moreover, how much would it cost to capture CO2 is yet to be known. The prototype plant set up in Squamish, British Colombia can capture CO2 released from nearly 14 to 15 vehicles. By scaling up the whole set up by 20,000 times, the designers suggest to capture CO2 emitted from 300,000 vehicles in a year. Also, air captured directly can eliminate more CO2 per acre of land footprint than what plants can do. The pure CO2 produced in the end can be used for industrial operations or can be stored underground in geological formations. The technology does seem promising in extracting CO2 from the atmosphere, it is still unlikely to solve environmental problems caused by CO2. We have to gradually shift our dependency on non renewable sources of energy to clean and renewable sources of energy, only then we may find a solution to our most carbon based mess created by humans.